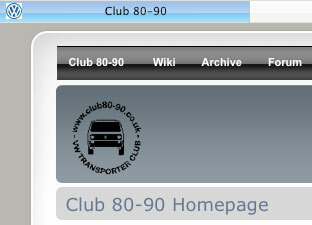 If you are thinking of basing your DIY campervan on a VW T25 transporter van or are doing up a T25 camper then you really ought to get over to Club 80-90: Their public forums require registration but are very active and provide masses of information and some very knowledgeable members are on hand to help with your technical issues. The club is an Internet based club, forum registration is not quite the same as joining the club but there appears to be no charge for either registration or club membership. Apart from the General Tech Advice forum (please first read any Announcements at the top), there are several more specific forums for Alternative Fuels (e.g. LPG), Alternative Engines, Modifications and Campers, so please try to target the right one for a quick and helpful answer.